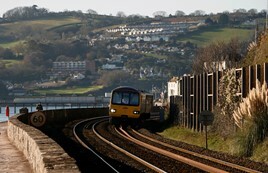 Cornwall Council and TravelWatch South West have expressed scepticism about the Government’s proposal to split the current Great Western Railway franchise into two, with a separate operation serving Wiltshire and the South West (RAIL 841). Speaking exclusively to RAIL, Cornwall Council Portfolio Holder for Transport Geoff Brown said of the franchise proposal: “We are really concerned about the splitting of the franchise - a smaller franchise provides fewer opportunities for cross-subsidy of less busy routes. However, Brown, who is also chairman of the Peninsula Rail Task Force, welcomed the Government’s decision to extend the current GWR franchise until 2022. Read the full EXCLUSIVE story in RAIL 843, pubilshed on January 3, available on Android/iPad on December 30. If the Greater Western franchise were to be split in half. Then the GW franchise should retain some of their current services such as London-Bristol, London-Cotswolds, London-Exeter, London-Bristol and Riviera night sleepers aswell other services in Wiltshire and Dorset, Reading-Basingstoke, Reading-Redhill/Gatwick Airport service and the Thames Valley local branch lines. Whilst the new rail franchise is to maintain and provide better rail services on the Cornish main line and local branch lines in Cornwall and Devon and local commuter services in the Exeter, Cardiff and Bristol areas. Plus to invest more new trains to reduce overcrowding and to provide extra seats for passengers in the Southwest of England and South Wales.